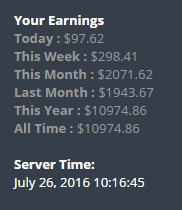 Here are my total earnings with OGads. I would like to continue updating this thread from time to time with more images. What do you guys think? Hi @friendlywebguy, You can teach me to generate ogads? (07-27-2016, 10:48 PM)tatusea Wrote: Signup or Login to view earning guides for mobile apps and websites. Hi @friendlywebguy, You can teach me to generate ogads? Here is a video showing you how to sign up for OGads. Skype 'thefriendlywebguy' once you are finished signing up. Way to go! Great to see your success!! Love seeing others succeed! Here is a link to one of my most successful methods with OGads! (07-27-2016, 10:20 PM)friendlywebguy Wrote: Signup or Login to view earning guides for mobile apps and websites. Amazing bro I am using it as well and in two days I got $ 1.90 can you give me some more ideas in MP please? (08-30-2016, 08:18 PM)ciclops007 Wrote: Signup or Login to view earning guides for mobile apps and websites. (08-30-2016, 09:01 PM)friendlywebguy Wrote: Signup or Login to view earning guides for mobile apps and websites. Good job brother, keep it up with more earnings to come! Hello, nice earnings Also your article on your site is pretty interesting as well but I do not know what do you mean under this "Other networks don’t work as well because they aren’t specialized for mobile traffic." (09-03-2016, 12:31 PM)BTMDario Wrote: Signup or Login to view earning guides for mobile apps and websites. (09-03-2016, 02:54 PM)friendlywebguy Wrote: Signup or Login to view earning guides for mobile apps and websites. Pretty much all networks have mobile app installs, not to talk about mobile surveys, pin submits so any network can work with your method(there are a bunch of old networks who are into mobile), so basically any network with lockers + mobile offers will work,right? (09-03-2016, 05:34 PM)BTMDario Wrote: Signup or Login to view earning guides for mobile apps and websites. Pretty much all networks have mobile app installs, not to talk about mobile surveys, pin submits so any network can work with your method(there are a bunch of old networks who are into mobile), so basically any network with lockers + mobile offers will work,right? Most networks have mobile app installs, but they are not optimized like OGads is. You can try other networks, but speaking from experience, I have a 45% conversion rate with ogads and a low 20% conversion rate with others. This is so inspiration. Keep this work up bro. You can get 1xx. Nice stats and great methods! How much do you reinvest or are all your methods free?? Hey, what's there to say? You're weekly or earnings, in general are decent. Also had a question. How many accounts do you have running currently if you don't mind me asking? Keep it up buddy! (10-05-2016, 11:40 AM)Before5am Wrote: Signup or Login to view earning guides for mobile apps and websites. Hey, what's there to say? You're weekly or earnings, in general are decent. Also had a question. How many accounts do you have running currently if you don't mind me asking? Keep it up buddy! May i ask you from where you receive traffic to ogads offers?